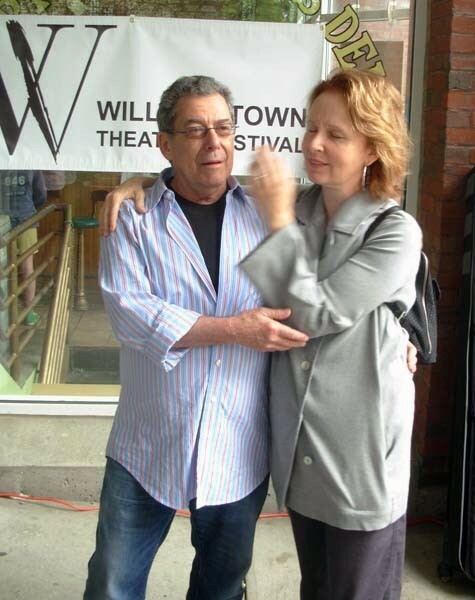 Kate Burton and director Nicholas Martin will again be cutting up during the Williamstown Theatre Festival. Giuliano photo. Williamstown Theatre Festival announces casting for the 2013 summer season’s slate of productions. On the Main Stage, the cast of Animal Crackers (playing June 26 – July 14, 2013) will include Jonathan Brody (Naked Boys Singing), Adam Chanler-Berat (Peter and the Starcatcher), Mara Davi (Death Takes a Holiday), Renée Elise Goldsberry (Good People), Ellen Harvey (How to Succeed...), and Jacob Ming Trent (Hands on a Hardbody), all making their WTF debuts. Next up on the Main Stage, Heather Lind, who started out as a member of WTF’s non-Equity company, and most recently appeared in last summer’s WTF production of The Blue Deep, will play ‘Eliza Doolittle’ in Pygmalion (running July 17 – 27, 2013). Lind, who made her Broadway debut in the Broadway revival of The Merchant of Venice opposite Al Pacino, joins the previously announced Robert Sean Leonard as ‘Henry Higgins’. They’re joined by Patricia Conolly (Is He Dead? ), Don Lee Sparks (Take Me Out), and Paxton Whitehead (The Importance of Being Earnest) in the show, directed by Nicholas Martin. Elena Shaddow (La Cage Aux Folles) will play ‘Francesca’ opposite Steven Pasquale in the World Premiere musical The Bridges of Madison County; they’re joined by frequent WTF player (and former non-Equity company member) Nick Bailey (Hit The Wall; WTF’s Becoming Sylvia; Tripolitania), Cass Morgan (Memphis; WTF’s Picnic, 1776), Whitney Bashor (Fly By Night), and Caitlin Kinnunen (Spring Awakening) in the show, which runs August 1 – 18, 2013. On the Nikos Stage, stage and screen favorite Ari Graynor (The Performers) makes her Williamstown debut in the World Premiere of Bess Wohl’s American Hero (June 26 – July 7, 2013), alongside Erin Wilhelmi (The Perks of Being a Wallflower), also making her WTF debut, and Josh Stamberg, a former non-Equity company member making his Equity WTF debut. James Cromwell (Babe), Jason Butler Harner (The Coast of Utopia; WTF\'s The Front Page), Jake Weber (A Small Family Business; WTF’s The Rivals), and Victor Williams (Luck of the Irish) join the previously announced Kate Burton in Tom Stoppard’s Hapgood, playing July 10 – 21, 2013. James Snyder (Cry-Baby), Burke Moses (Beauty and the Beast; WTF’s 1776), Joe Cassidy (Catch Me If You Can), Alan Green (Sister Act) and Roger Robinson (Joe Turner’s Come and Gone) perform in Johnny Baseball, the new musical which runs July 24 – August 3, 2013. And the entire Off Broadway company of The Debate Society’s Blood Play, including Paul Thureen, Michael Cyril Creighton, Hannah Bos, Hanlon Smith-Dorsey, Birgit Huppuch and Emma Galvin, reunite for the Williamstown Theatre Festival premiere of the acclaimed play, closing out the Nikos Stage season, from August 7 – 18, 2013.